Probabilistic Databases (PDBs) lie at the expressive intersection of databases, first-order logic, and probability theory. PDBs employ logical deduction rules to process Select-Project-Join (SPJ) queries, which form the basis for a variety of declarative query languages such as Datalog, Relational Algebra, and SQL. They employ logical consistency constraints to resolve data inconsistencies, and they represent query answers via logical lineage formulas (aka.“data provenance”) to trace the dependencies between these answers and the input tuples that led to their derivation. While the literature on PDBs dates back to more than 25 years of research, only fairly recently the key role of lineage for establishing a closed and complete representation model of relational operations over this kind of probabilistic data was discovered. Although PDBs benefit from their efficient and scalable database infrastructures for data storage and indexing, they couple the data computation with probabilistic inference, the latter of which remains a #P-hard problem also in the context of PDBs. In this chapter, we provide a review on the key concepts of PDBs with a particular focus on our own recent research results related to this field. 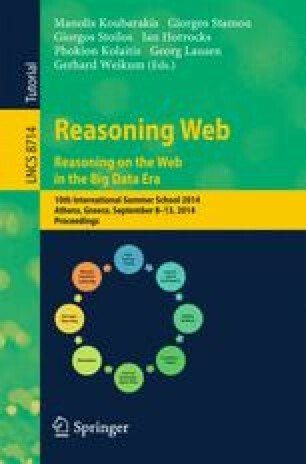 We highlight a number of ongoing research challenges related to PDBs, and we keep referring to an information extraction (IE) scenario as a running application to manage uncertain and temporal facts obtained from IE techniques directly inside a PDB setting.